Today Russia’s RSC Group announced that the company has received the elite HPC Data Center Specialist partner status from Intel Corporation, confirming the very high level competence of company’s employees and its business experience in development and deployment of HPC solutions based on Intel server products. According to RSC, only 12 companies in the EMEA region have received such recognition while only 35 Intel partners have received it worldwide. 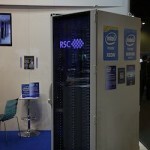 Today the RSC Group out of Russia announced a new generation of high-performance scalable and energy-efficient RSC Tornado solution with direct liquid cooling based on the newest multi-core Intel Xeon Phi processor (previously code named as Knights Landing) on the day of global launch of this product. The new RSC solution has improved physical and computing density, high energy efficiency and provides stable operation in “hot water” mode with +63 °С cooling agent temperature.